In this episode, Jason and Cristina give you a full breakdown of the Series 11 season finaleThe Battle of Ranskoor Av Kolos. An Enemy Returns, Faith-Driven Engineering, Travel Hopefully. Check out our Patreon page where we give you bonus content and monthly movie reviews! Sponsor: Songfinch.com - Songfinch gives customers the opportunity to harness the power by transforming their favorite stories, memories and shared details into one-of-a-kind songs that make for unforgettable gifts. USE promo code: Klatchers for $20 off Songs From Scratch Email us at contact@coffeeklatchcrew.com Tweet it! : Tweet: Listening to the Coffee Klatch Crew Podcast on iTunes! #ckcpodcast Facebook: Facebook page! Subscribe to us via iTunes! In this episode, Jason and Cristina give you a full breakdown of Series 11 Episode 9 It Takes You Away. The Solitract, A Mirror Portal, An Antizone. Check out our Patreon page where we give you bonus content and monthly movie reviews! Sponsor: Songfinch.com - Songfinch gives customers the opportunity to harness the power by transforming their favorite stories, memories and shared details into one-of-a-kind songs that make for unforgettable gifts. USE promo code: Klatchers for $20 off Songs From Scratch Email us at contact@coffeeklatchcrew.com Tweet it! : Tweet: Listening to the Coffee Klatch Crew Podcast on iTunes! #ckcpodcast Facebook: Facebook page! Subscribe to us via iTunes! In this episode, Jason and Cristina give you a full breakdown of Series 11 Episode 6 of Doctor Who. Technology over humans! Check out our Patreon page where we give you bonus content and monthly movie reviews! Email us at contact@coffeeklatchcrew.com Tweet it! : Tweet: Listening to the Coffee Klatch Crew Podcast on iTunes! #ckcpodcast Facebook: Facebook page! Subscribe to us via iTunes! In this episode, Jason and Cristina give you a full breakdown of Series 11 Episode 5 of Doctor Who. The Pting, Antimatter, and Pilot’s Heart. Check out our Patreon page where we give you bonus content and monthly movie reviews! Email us at contact@coffeeklatchcrew.com Tweet it! : Tweet: Listening to the Coffee Klatch Crew Podcast on iTunes! #ckcpodcast Facebook: Facebook page! Subscribe to us via iTunes! In this episode, Jason and Cristina give you a full breakdown of Series 11 Episode 3 of Doctor Who. Krasko, Artron Energy, Rosa Parks. Check out our Patreon page where we give you bonus content and monthly movie reviews! Email us at contact@coffeeklatchcrew.com Tweet it! : Tweet: Listening to the Coffee Klatch Crew Podcast on iTunes! #ckcpodcast Facebook: Facebook page! Subscribe to us via iTunes! In this episode, Jason and Cristina give you a full breakdown of Series 11 Episode 2 of Doctor Who. The Rally, The Remnants, The Ghost Monument Check out our Patreon page where we give you bonus content and monthly movie reviews! Email us at contact@coffeeklatchcrew.com Tweet it! : Tweet: Listening to the Coffee Klatch Crew Podcast on iTunes! #ckcpodcast Facebook: Facebook page! Subscribe to us via iTunes! Jason and Cristina bring you a review of last years Dr. Who Christmas Special, Twice Upon a Time. This was originally a Patreon only cast last year but in celebration of our newest CKC channel its free for all. In this beautiful send off episode to the 12th Dr as well as Steven Moffat we get an emotional treat to get prepared for the new season! Check out our Patreon page where we give you bonus content and monthly movie reviews! Email us at contact@coffeeklatchcrew.com Tweet it! 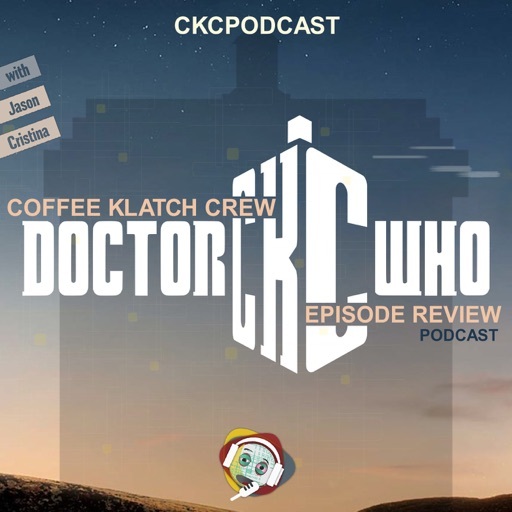 : Tweet: Listening to the Coffee Klatch Crew Podcast on iTunes! #ckcpodcast Facebook: Facebook page! Subscribe to us via iTunes! © 2019 OwlTail All rights reserved. OwlTail only owns the podcast episode rankings. Copyright of underlying podcast content is owned by the publisher, not OwlTail. Audio is streamed directly from Coffee Klatch Crew servers. Downloads goes directly to publisher.